Chickpeas, olive oil and sesame paste, or tahini, are the main ingredients in hummus, a nutritious Middle-Eastern dip. Seasoned with garlic, lemon juice, cumin and black pepper, a healthy recipe for hummus is low in sodium and high in protein. 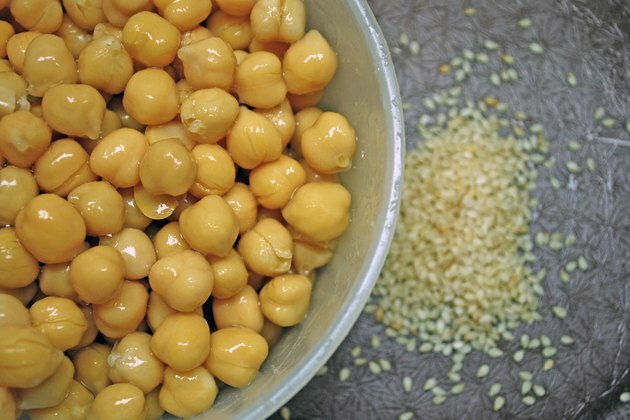 Don't let the fat content in hummus discourage you from snacking on this nutrient-rich food – the plant-based fats in chickpeas may help you control your cholesterol levels, according to the American Heart Association. 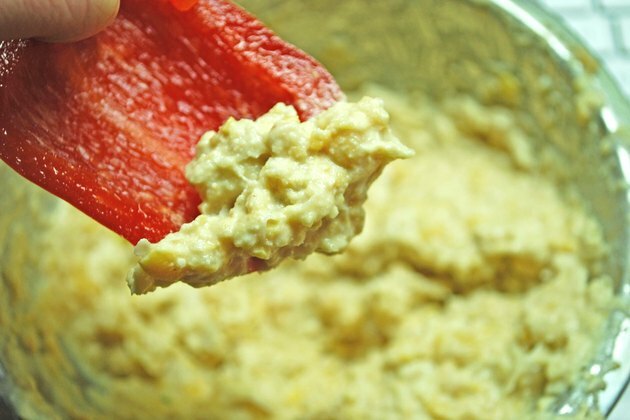 Two tablespoons of hummus have 48 calories, 2 grams of protein, 6 grams of carbohydrate, 2 grams of fiber, 1 gram of monounsaturated fat and 106 milligrams of sodium. 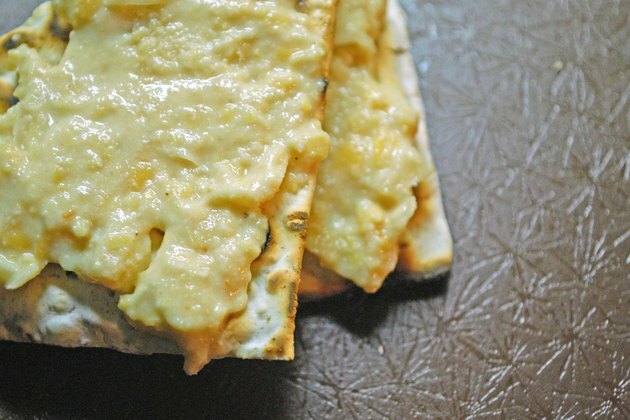 Hummus complements the flavor of pita, a Middle-Eastern flat bread. A snack of hummus on toasted whole-wheat pita wedges provides protein, fiber and complex carbohydrates. You can also eat hummus on whole-grain crackers or low-fat tortilla chips as an alternative to sliced cheese or cheese dips. According to the American Heart Association, the monounsaturated fats in plant-based foods like chickpeas may help lower your cholesterol, while the saturated fats in cheese and other dairy foods can raise serum cholesterol levels and increase your risk of heart disease. To increase your intake of fresh vegetables and avoid the calories and fat in ranch dressing, "Fitness" recommends that you dip baby carrots, zucchini slices, broccoli and cauliflower florets, sugar snap peas and red pepper slices in hummus. The creamy texture of hummus blends well with the cool crunch of raw vegetables. For a sweeter alternative, try hummus with raw apple slices. A diet rich in vegetables and fruits may protect you against chronic disease, boost your natural immunity and help you manage your blood pressure, according to the Centers for Disease Control and Prevention. 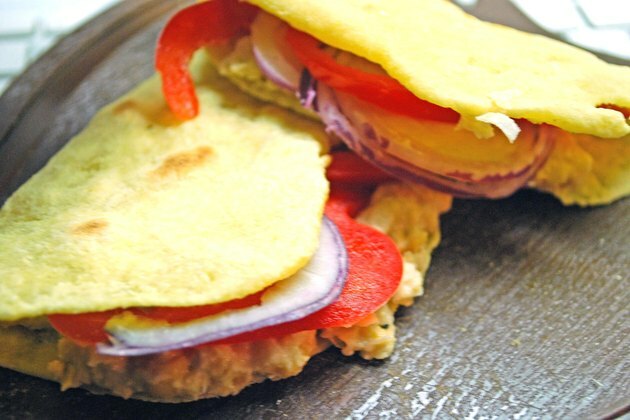 To make a quick, cross-cultural snack that blends nutritious Middle-Eastern and Mexican foods, spread a thin layer of hummus on a flour tortilla, and then place the tortilla on a warm, lightly oiled skillet. Layer the tortilla with sliced avocados and finely chopped onions or red or green bell peppers. Fold the tortilla in half and brown on both sides, then slice the quesadilla into two or three triangles. A garnish of tomato salsa adds extra vitamin C and potassium. To reduce the saturated fat in your diet and improve your cardiovascular health, substitute hummus for butter, mayonnaise and other spreads that are high in saturated fat. Sandwiches with hummus, cucumber slices, alfalfa sprouts, romaine lettuce and tomatoes on whole-grain bread provide protein, fiber, potassium and vitamins A and C. Cut the bread into four sections to make snack-size sandwiches, or enjoy a whole sandwich for lunch. To make a variation on a classic, high-fiber kids' snack, fill celery sticks with hummus instead of peanut butter, and then dot the center of the celery stick with a line of "ants," or raisins. To make a grown-up version of this snack, you can substitute olive halves, capers or almond slivers for raisins.